Need-2-Know books produce a huge range of essential guide books for young people, parents, teachers and professionals. They cover a wide variety of topics – everything from guides about infertility to child obesity to gardening. Most topics that you can think of are covered. I was given the opportunity to read and review two of their books and the first one I chose was ‘Caring for Your Dog, The Essential Guide’ – I’m sure you’re not surprised that I chose a book about dogs! 'In the UK there are around eight million pet dogs, perhaps that is why they are thought of as man’s best friend. It has been proven that dogs are good for your health, they encourage you to exercise and dog owners suffer less stress. Owning a dog can sometimes be a bewildering experience full of decisions affecting your pet’s welfare, for example, micro-chipping, vaccinations and pet insurance. This handy practical guide will address all of these issues from a puppy-aged pet right through to old-age. The puppy years are well covered, including puppy-proofing your home, diet, toilet training, vaccinations and other vet treatments, training and socialising. Small, medium and large breeds are catered for, along with feeding and exercise advice for older dogs, doggy first aid for basic cuts and scrapes, how to administer tablets and medication and what to do in the event of different symptoms of illness. This is a comprehensive guide that would be ideal for first-time dog owners or someone thinking of getting a dog. Having said that though, it would also be a great reference book for more experienced dog owners. We’ve always had at least one dog since I was three years old, and for the last few years I’ve been involved with a dog rescue, but there was still a lot in the book that I didn’t know. For example I never knew that cheese can affect a dog’s pancreas. Cheese is one of Henry’s favourite treats, but he will definitely not have as much of it now. Each chapter is split into sub-sections with clear section headings. The book is clear and easy to read. It is interesting enough for you to sit down and read it all, but equally it would be easy just to flick through to find the information that you need. The chapter I found the most useful was the doggy first aid chapter which covers the most common accidents dogs can have and what you should keep in your first aid box – very useful when you’ve got an accident prone lurcher like Skipper! This book covers everything from pet insurance to what to do if you lose your dog. It is well written and includes lots of contact details and website addresses of other useful organisations. 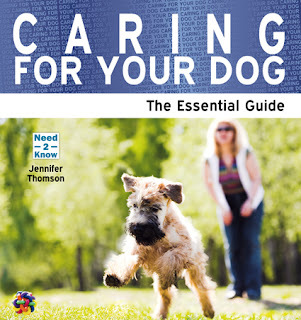 It covers the basics of dog ownership well, without coming across as patronising. I was especially pleased to see a chapter on dog rescues which was well balanced and informative. I think this is a ‘must-have’ book for all dog owners or future dog owners. Leave a comment below with a way to contact you (email or twitter user name). I'm following you on Twitter and have tweeted.